What can you say about a 93-year old actor who was Dracula? Much in the way that he was Saruman. Or Dr. Fu Man Chu. Or Sherlock Holmes. Or one of the better Bond villains. Or … you know what? We’re running out of room already. You start by saying that Christopher Lee was one of the more interesting actors allowed in the British cinema. To begin with, Christopher Lee served in World War II, with the precursors to the SAS. He was killing Nazis behind enemy lines before anyone thought it would make a good movie. Top that off with the fact that he was 6’5″ tall, you end up with a man you do not want meet in a dark alley. …And then Peter Jackson backed away slowly and let Lee do whatever he liked. And then there are his roles. He’s one of the few people who could make Dr. Fu Man Chu both terrifying and remotely threatening. Not bad for an anglo. No, Peter Sellers doesn’t count. Of course, he was Dracula … in Hammer films so terribly written, Lee himself had insisted that he would only come back for a few of them only if he just hissed — he didn’t want to choke out that dialogue anymore. And he was a Mummy, and a Frankenstein monster, and, of all things, he was the targeted victim in a Hammer Hound of the Baskervilles, to be saved by a Holmes, played by his usual on-screen nemesis Peter Cushing (maybe better known to some of us as Grand Moff Tarkin). But he was also a Tolkien nerd. Yes. Really. He has a few CDs attached to it — and unlike Nemoy, he could sing about Bilbo if he wanted to. Believe it or not, Lee originally wanted to be Gandalf in Lord of the Rings. But he was Dracula, and there was nothing more to be done about that. One of these days, cue up the Lord of the Rings extended editions, and listen to the actors’ commentary just with Christopher Lee. He is so thoughtful. So precise. So eloquent. And yet still so very creepy. Also on the extended edition for The Two Towers, look up the section on Gandalf’s reappearance. Lee and Ian McKellen were to impersonate each other, and the voices mixed together. Lee sounds so much like McKellen’s Gandalf, if makes you wonder what would have happened if Lee had been given the role he wanted. Then there’s his discography. If you didn’t know he could sing, check out his Heavy Metal Christmas album. Yes. Really. It has the most interesting rendition of The Little Drummer Boy. Also, Lee was basically singing opera while the band was playing heavy metal. (Also, yes, I know about his role as a singing supervillain in The Return of Captain Invincible — it was odd). Honestly? I thought he was going to keep going just on inertia alone. Like Stan Lee … who will also be 93 this year. 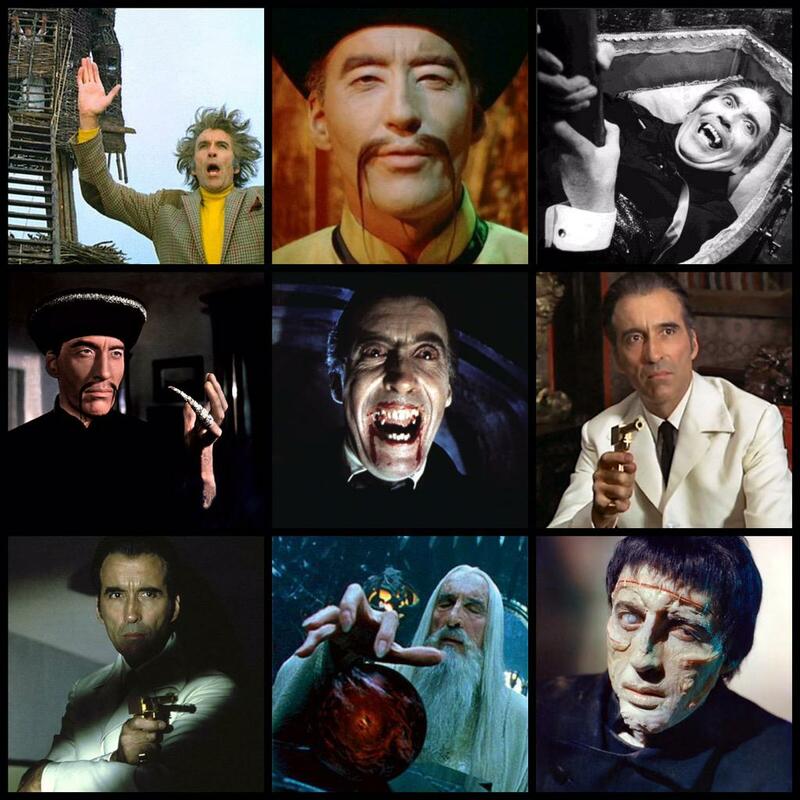 What can you say about Christopher Lee? You say he had class. You say he was a man who had the respect of his peers. You say that he fought and bled for his country … well, he at least made other people bleed for their country, we know that. This is a man who PM David Cameron hailed as a “titan of the golden age of cinema.” Mark Gatiss — co-creator of Sherlock, Mycroft actor, and Doctor Who scribe / actor — called him “great, always criminally underrated …. A Titan of Cinema and a huge part of my youth.” Even Roger Moore claimed him as a friend. You say he was married for 53 years and stated that his secret was that he married someone wonderful. And most importantly, you speak of him with respect, and you say very, very nice things about him, because he was a gentleman … and because he may come back as a vampire. Yes, you know I had to go there. This entry was posted in Analysis, Commentary, News, Reviews and tagged Christopher Lee, David Cameron, Dracula, Frankenstein, Fu Man Chu, Hammer Films, J. R. R. Tolkien, Mark Gatiss, Music, Obituary, Peter Jackson, Peter Sellers, Sherlock Holmes, Stan Lee, The Lord of the Rings, World War II. Bookmark the permalink.